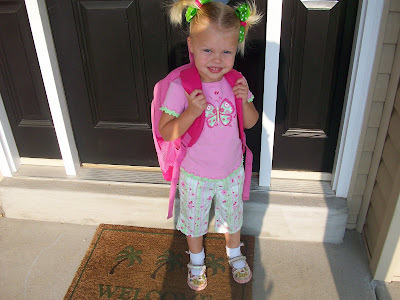 Sophie had her FIRST day of preschool a few days ago. 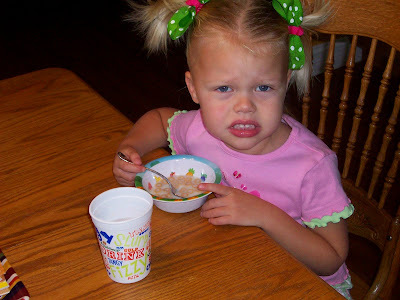 Her attitude during breakfast was not very chipper. She perked up a bit outside for our traditional backpack pose. The sun was too bright and sparked the crabby nerve once again. By this point there were real tears. 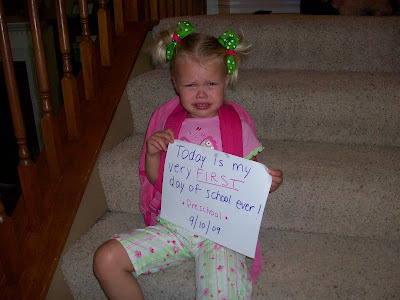 "I don't want to go to school!" "I will miss you Mommy!" My little So-Mo (as Mia calls her) was about to make ME cry. I thought a "SISTER" pose would cheer her up! She was so cute climbing in the Suburban with Daddy and Mia. 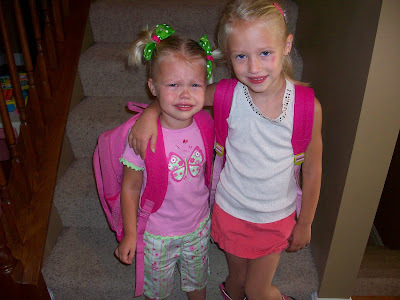 I tried not to cry as I watched two of my three girls go on about their day and head off to school like no body's business. The hardest thing for me when I have to be away from my girls is asking myself, "Do they KNOW how much I love them?" I wonder if they know how much they mean to me when I am NOT with them. When I am UNABLE to tell them. UNABLE to talk to them at all. UNABLE to see them. It is the most difficult thing for me as a mom. My time when I CAN'T be with them. 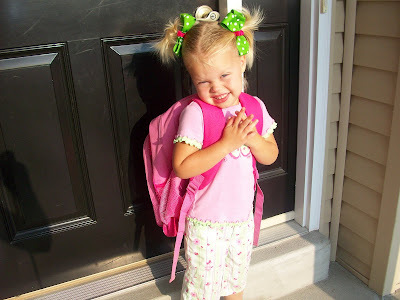 Sophie LOVED her first day of Preschool so much. 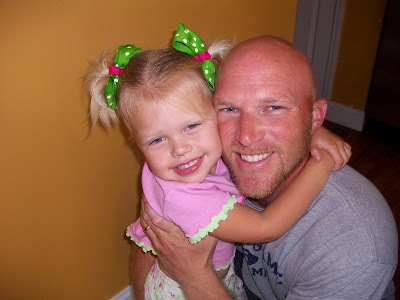 Here is the AFTER shot with Daddy! YAY for So-Mo, So-Fo, Silly So-Mo... and whatever other nicknames Mia has for you! 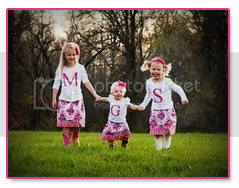 My little munchkin girls are not so little anymore. oh my goodness! Those pictures are priceless. So sad, yet so cute! 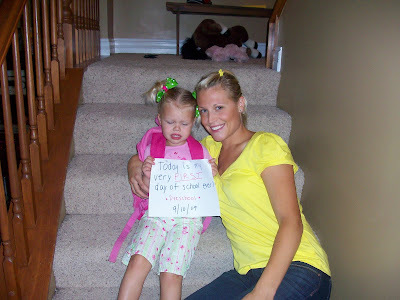 Glad she ended up having a great day! Oh my....but she looked cute!!! I love the signs you make for them. I'm going to have to remember that! OMG Those pics are adorable! 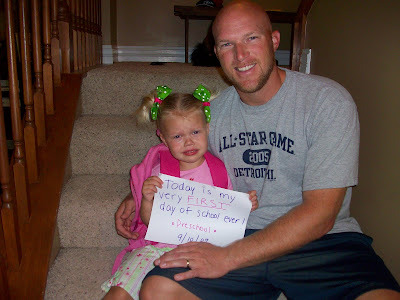 I've read a lot of first day of school posts and this is the only one with a crying kid :( But hopefully that means she is so happy at home! 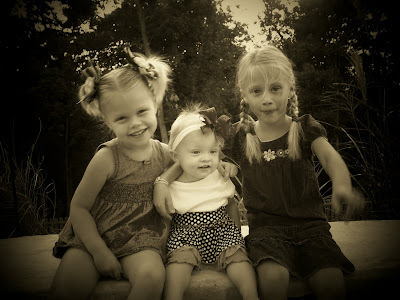 Your little girls are so pretty! Cuteness times 3! You have your hands full, huh? Thank you for all your wonderful comments and my blog!